In recent years, educators have been trying to narrow the chasm between research and practice. Part of the challenge is that research that is detached from practice “may not account for the influence of contexts, the emergent and complex nature of outcomes, and the incompleteness of knowledge about which factors are relevant for prediction”. The need to go beyond narrow measures of learning. The need to derive research findings from formative evaluation. development of such accounts relies on methods that can document and connect processes of enactment to outcomes of interest. “In traditional evaluation, an intervention (e.g. a textbook, an instructional program, a policy) is measured against a set of standards. During formative evaluation, iterative cycles of development, implementation, and study allow the designer to gather information about how an intervention is or is not succeeding in ways that might lead to better design. Then the intervention is ‘frozen’, and the rigorous summative evaluation begins….Like formative evaluation, design-based research uses mixed methods to analyze an intervention’s outcomes and refine the intervention. Unlike evaluation research, design-based research views a successful innovation as a joint product of the designed intervention and the context. Hence, design-based research goes beyond perfecting a particular product. The intention of design-based research…is to inquire more broadly into the nature of learning in a complex system and to refine generative or predictive theories of learning. Models of successful innovation can be generated through such work — models, rather than particular artifacts or programs, are the goal”. Cobb, P., diSessa, A., Lehrer, R., Schauble, L. (2003). Design experiments in educational research. Educational Researcher, 32(1): 9-13. Brown, A. L. (1992). Design experiments: Theoretical and methodological challenges in creating complex interventions in classroom settings. The Journal of the Learning Sciences, 2(2): 141-178. Collins, A. (1992). Towards a design science of education. In E. Scanlon & T. O’Shea (Eds. ), New directions in educational technology (pp. 15-22). Berlin: Springer. Design-Based Research Collective. (2003). 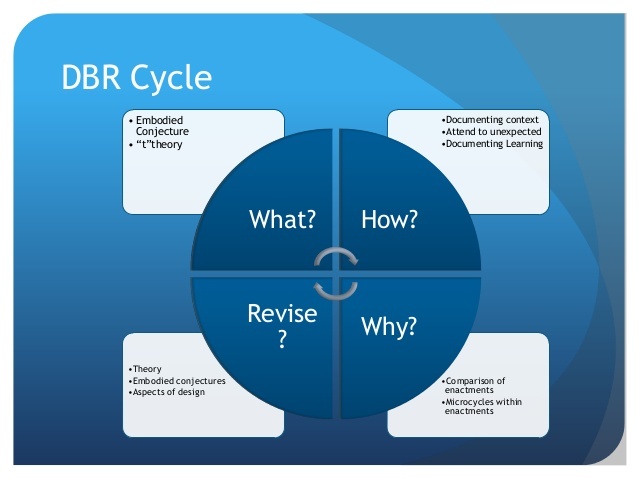 Design-based research: An emerging paradigm for educational inquiry. Educational Researcher, 32(1): 5-8. Barab, S., & Squire, K. (2004). Design-based research: Putting a stake in the ground. The Journal of the Learning Sciences, 13(1).